This paper provides a theoretical framework for analysis of consensus algorithms for multi-agent networked systems with an emphasis on the role of directed information flow, robustness to changes in network topology due to link/node failures, time-delays, and performance guarantees. An overview of basic concepts of information consensus in networks and methods of convergence and performance analysis for the algorithms are provided. Our analysis framework is based on tools from matrix theory, algebraic graph theory, and control theory. We discuss the connections between consensus problems in networked dynamic systems and diverse applications including synchronization of coupled oscillators, flocking, formation control, fast consensus in small world networks, Markov processes and gossip-based algorithms, load balancing in networks, rendezvous in space, distributed sensor fusion in sensor networks, and belief propagation. 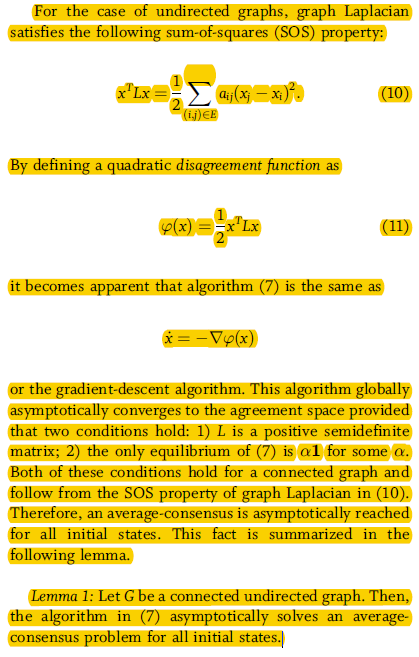 We establish direct connections between spectral and structural properties of complex networks and the speed of information diffusion of consensus algorithms. A brief introduction is provided on networked systems with non-local information flow that are considerably faster than distributed systems with lattice-type nearest neighbor interactions. Simulation results are presented that demonstrate the role of small world effects on the speed of consensus algorithms and cooperative control of multi vehicle formations. This entry was posted in Bubbles and AntiBubbles, Papers on December 19, 2017 by pgfeldman.